Genes from microorganisms allow neurons to be controlled by light pulses via fiber optics. What do you get when you combine microorganisms and fiber optics? 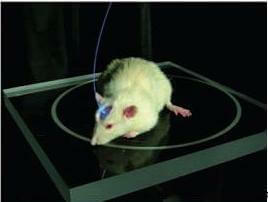 Mind control over mice and rats. Karl Deisseroth and his team at Stanford University have been making serious inroads into discovering how the brain works through optogenetics. The genes of certain algae and archae are spliced into rodent neurons, making them respond to light. Blue light turns the neuron on. Yellow light turns the neuron off. A fiber optic cable is connected into a living mouse or rat with the spliced genes allowing scientists to expose different neurons to different lights. The results are astounding. Stimulate the right hemisphere of a mouse, and it runs in circles to the left. Check it out in the video below! Of course the applications for optogenetics go far beyond making mice run in circles. Deisseroth is able to target different neuron types, not just hemispheres of the brain. As he explains in the following video of a presentation at Stanford, such targeting gave give insight into the neurological mechanisms behind psychological conditions like depression (~14:55). By targeting the hypothalamus, scientists are even able to create basal wants and desires in animals (13:30). Deisseroth also gives an indepth look at the microorganisms and cell mechanisms that enable the photonic brain control (5:30), and how narcolepsy is triggered by stimuli in animals and humans (11:30). The genetically modified rodent neurons contain proteins from algae and archae that were introduced via a virus. By pairing those proteins with receptors in the cell, Deisseroth has created a genetically encoded optical tool called an optoXR. These tools allow for control in the brain with great spatial and temporal resolution (as published in Nature, 2009). Deisseroth can control individual signaling pathways in neurons on a timescale of tens of milliseconds. According to Technology Review, the Deisseroth Lab used this signaling pathway control to induce drug-addicted type behavior in mice: The animals were allowed to roam freely through an area, but given light-pulses to the brain when they were in a designated “pleasure room”. Eventually, the mice learned to spend most of their time in that room. As Deisseroth mentions in his talk, this can be pretty scary stuff. For now his group is working on understanding models of depression and other mental illnesses so that they can improve treatment. Eventually, optogenetics may give rise to technologies which could be used to affect human psychology directly through the brain. That’s delicate territory. What happens when genetic manipulation and miniaturized electronics allow us to directly target parts of our brain and stimulate them as we wish? What happens if we understand how to stimulate the hypothalamus and make anyone hungry? Or angry? Or aroused? We’ve already seen implants that seek to treat epilepsy, or connect our motor neurons to computers. The idea of putting a device in our heads to regulate our emotions isn’t completely impossible. Luckily it will take years of research before we are faced with the necessity of answering these questions. But they are coming. The Deisseroth Lab isn’t the only team pursuing optogenetics. MIT Media Labs recently published in Nature to describe its own techniques for manipulating rodent brains while they are still alive. Optogenetics has become a proven avenue of research that is only going to become more intense as it continues to produce remarkable results. Human brain control, either to treat depression or something more nefarious, is years away. For mice, mind control is already here. A little scary, but hey, at least they get to hang out in the pleasure room as much as they like.